If we’re gunning for an Oscar, we’re a bit late to the party. But Castle and Pryor haven’t gone unnoticed this award’s season! Last week, Marius and Allan brought home a win for their innovative thinking on site. 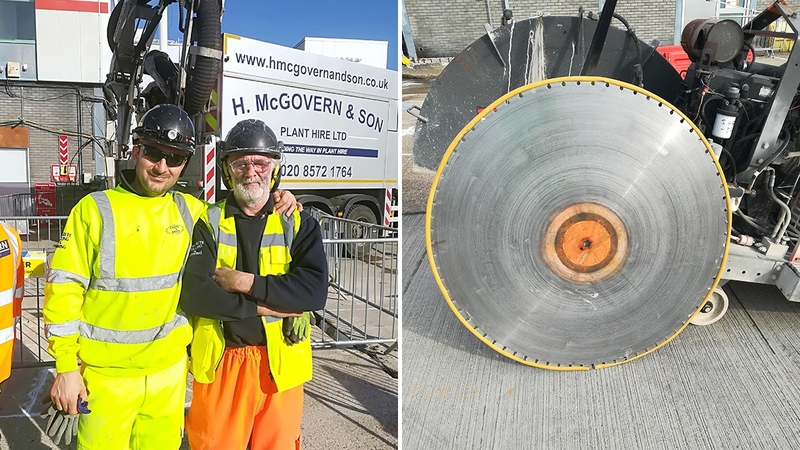 Whilst working with Careys at London Heathrow, the nifty pair employed a humble hosepipe and some out-of-the-box thinking, to tick a whole host of boxes: Manual Handling, Protecting Others, Recycling… The list goes on. So, how did they do it? We were back at London Heathrow Airport again! This time, assisting PJ Careys with saw cutting and drilling for the removal of damaged concrete at Stands 323 & 325. Large blades are tricky to move and must be handled with extreme care. With a diameter of 1.5m, weighing in at 52kg and only 3mm thick, the blades are not only extremely heavy to move by hand but there’s also the flex issue at play. The blades have to be moved on a vertical plane, keeping them upright throughout, otherwise, you risk throwing the blade out of shape. Conventional handling can cause segment loss as the blade is rotated along the ground. Segments around the perimeter of these blades were 15mm tall and 4mm wide - making them more difficult to move, especially over poor ground. If dropped during the move, there’s potential to break a segment - rendering the entire blade useless. With a list price of £2500.00 per blade, protection was just what we needed! By placing a rod through the centre, Allan and Marius reduced the amount of manual handling required. They also placed a cut down a piece of hosepipe around the circumference of the blades to protect the segments. Plus, it added extra protection for the team’s hands which made a huge difference for them - even when wearing their Cut 5 gloves. Congratulations, guys! And thanks to Heathrow’s Airbridge Management Team for their nomination. Another job well done and an ingenious solution to your name! Need your airfield contractor to think outside the box? Get in touch with us today for your free quote.